Windows 8 is a giant mistake. It turns your desktop computer into a non-portable cell-phone that cannot make calls. A cell phone has a tiny screen, so Windows 8 pretends the desktop screen is also tiny and only shows you about 9 random things (tiles) at a time. To find what you want, you have to play rabbit and chase through a warren of hundreds of chaotic menus. The desktop is hidden two layers deep. The start menu is gone. The reboot icon is gone. It is maddeningly idiotic. I recommend installing Windows 7 over top of it or trying for Windows 10. The other thing it does is continually leave you at a dead end where the only way out is to reboot. Putting a positive spin on it, Windows 8 is Microsoft’s new version of Windows. You probably want the 64-bit version. The 32-bit version is for computers with 3 GIG or less RAM (Random Access Memory). It has a new interface called Metro that uses tiles rather than launch icons. The tiles can display changing information. Ironically, Windows no longer tiles the screen with windows. Internet Explorer looks less cluttered and runs faster. A shadow of the legacy Windows 7-style interface is still available on the version for desktop computers, buried. Part of what MS is up to is making Windows 8 run well on small screens that you find on portable devices. It works to keep visual clutter to a minimum. It seamlessly integrates cloud storage so that much of what you store on your PC (Personal Computer) is also available to your mobile devices. It more geared toward the novice. Experts have to invoke special expert menus to see the familiar confusing detail. Some files are automatically versioned, so you can see what they looked like over time. Now, when you have multiple monitors, each monitor gets its own task bar. The lite version of Windows 8 for hand helds and the ARM CPU (Central Processing Unit) is called Windows RT. The O & O Migration kit will preserve your settings from the old OS (Operating System) when you install Windows 7 or Windows 8. Windows 8 has been a somewhat of a flop. It was drastically changed to provide compatibility with small screen handhelds. This created a steep learning curve and destroyed the efficiency of the desktop UI. If you are a pure desktop user familiar with Windows 7, everything has needlessly changed. Microsoft has announced a major revision to try to make it more compatible with Windows 7 and more focused on the needs of desktop users. If you change the name of your computer or its workgroup, you will not be able to add any user accounts (The system will ignore you without error if you try) until you reboot. 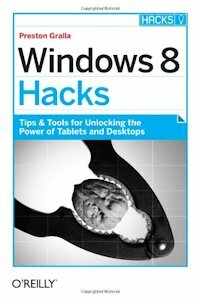 How to use the many obscure features of Windows 8, especially features to let it connect with other computers and devices.